The scale is nothing more than lime dental plaque (plaque). The most important preventive activity is the regular, proper brushing of the teeth. If the removal of the plaque is not perfect, the scale in the area will develop after time. If we do not regularly remove the plaque from our teeth, after time, limestone crystals from the saliva build up and the scale is formed. The scale is firmly attached to the tooth, removing it with simple brushing is impracticable, and can only be removed by a specialist (dentist or dental hygienist). 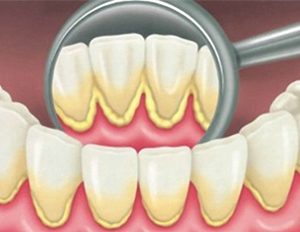 The scale may irritate the gum by inflammation, and then it may cause periodontitis, bone loss, lashing and then loss of teeth, and aesthetically ugly, discoloration of the teeth, and unpleasant mouth odor. The formation of the scale also depends on hereditary factors and lifestyle habits, but the already developed scales should be removed at least twice a year, in the professional dentistry cleaning procedure! In the dental clinic, the removal of the scale is done by a dentist, dental hygienic with an ultrasonic needle removal device (depurator). With ultrasound vibration, the scale can be completely removed without damaging the tooth enamel! After removing the scale, the tooth surface is polished. The teeth are polished with special paste and brushes. On the smooth surface the plaque can less to stick, the scale becomes harder to develop again. The result is a perfectly clear and smooth, non-discolored, brilliant denture!